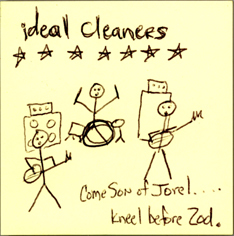 Ideal Cleaners is in Lincoln, NE. Over in the Eastridge neighborhood. We usually play for as little money and for as few people as possible. If you know of any sweet gigs that fit those criteria, please give us a call.